I spent a little time on the Black Forest sign this morning, just enough to satisfy myself it was going to all work out fine. I often bid and start a project without thinking it all the way through. There is no sense in worrying about something until it is time. Then it always seems to work out in the end... and I don't loose any sleep from worrying. This time was no exception. 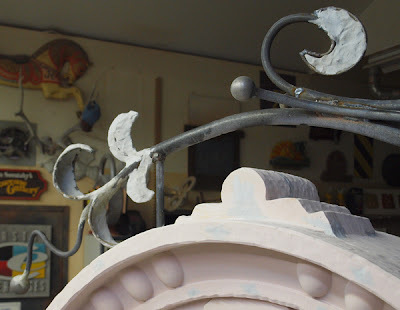 While I would have loved to invest in a forge or hired someone else with those skills to produce the wrought iron bracket, the truth is time and the budget were working against me. But I figured I would be able to duplicate the look in such a way it would be impossible to tell it wasn't real. The bracket will be about 14' off the ground when it is mounted. I then added texture to the faces corners, and edges of the sign with the die grinder. 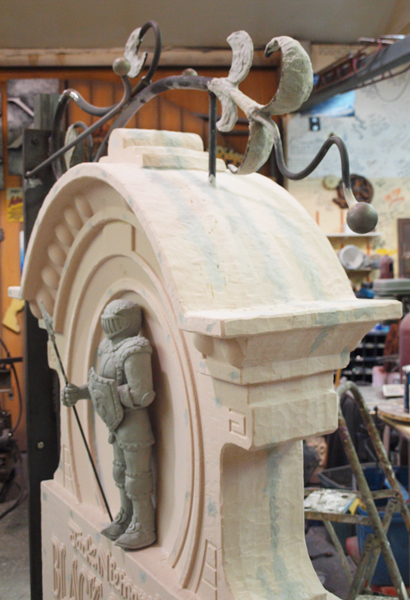 I still have the decorative finale to put on the top faces and a few more details before the paint is started. With the large cornice moulding the sign looks pretty substantial. The30 lb Precision Board glued up pretty fine. After I had finished the texture I filled a couple of cracks I had created by not clamping the pieces quite tight enough and all the screw holes, making this part of the sign ready for paint. Next week it will come together real quick!